detailed modeling of nuclear systems via deterministic transport models and optimal shape design for nuclear components using search techniques. 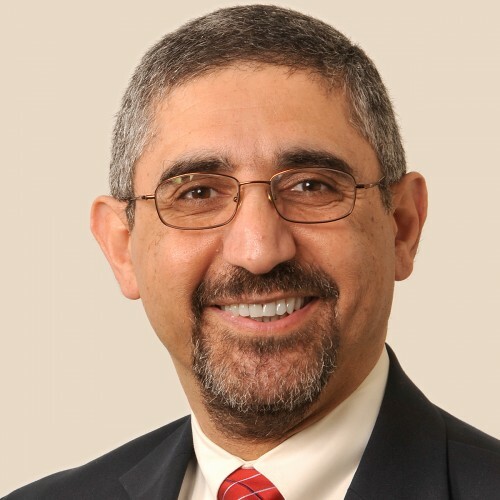 Dr. Azmy's research is focused on the development, implementation, and analysis of advanced methods and solution techniques for particle transport problems. This defines an area within the broader field of nuclear computational science whose ultimate purpose is to provide the community of nuclear scientists and engineers with advanced computational codes that comprise an enabling technology for addressing a multitude of problems involving particle and radiation transport phenomena. In this regard he contributed to Oak Ridge National Laboratory's DOORS code package that includes, among others, the renowned DORT and TORT codes, serving as lead developer of the latter in the late nineties. Barichello, L. B., Tres, A., Picoloto, C. B., & Azmy, Y. Y. (2016), Journal of Computational and Theoretical Transport, 45(4), 299–313. Schunert, S., & Azmy, Y. (2015), Nuclear Science and Engineering, 180(1), 1–29. Hykes, J. M., & Azmy, Y. Y. (2015), Nuclear Science and Engineering, 179(4), 364–380. Schunert, S., & Azmy, Y. (2013), Nuclear Science and Engineering, 173(3), 233–258. Ferrer, R. M., & Azmy, Y. Y. (2012), Nuclear Science and Engineering, 172(1), 33–51. Gill, D. F., & Azmy, Y. Y. (2011), Nuclear Science and Engineering, 167(2), 141–153. Gill, D. F., Azmy, Y. Y., Warsa, J. S., & Densmore, J. D. (2011), Nuclear Science and Engineering, 168(1), 37–58. Rosa, M., Azmy, Y. Y., & Morel, J. E. (2010), Nuclear Science and Engineering, 166(3), 218–238. The PI (Dr. Yousry Y. Azmy) from NC State University (NCSU) has a standing interest in the development and implementation of advanced numerical methods for solving radiation transport problems using the discrete ordinates approximation, and of advanced algorithms for solving the resulting systems of equations on multiprocessor platforms. Meanwhile Idaho National Laboratory (INL) as the designated nuclear energy lab in DOEâ€™s national laboratory complex is spearheading efforts to modernize computational capabilities in the nuclear field, a field that has become heavily reliant (for good reason) on modeling and simulation. Among recent developments in both institutions that are relevant to this proposal are the radiation transport codes for unstructured meshes THOR at NCSU and RattleSnake at INL. While these codes are founded on drastically different methods they address the same physics and possess similar applications and objectives. Hence it would be valuable for the two research groups at INL and NCSU to share their experiences and coordinate the evolution of their respective methods, algorithms and codes. The work proposed here seeks to establish a formal framework for this cooperative effort. The work performed under this subcontract supports an approved ORNL/NC State Joint Faculty Assignment with the Department of Nuclear Engineering (NE) at North Carolina State University and the Nuclear Security & Isotope Division at the Oak Ridge National Laboratory (ORNL). The work performed under this subcontract, by Dr. John Mattingly, will support the development and use of nuclear computational tools and methods for application in nuclear nonproliferation, nuclear security, and homeland security. Dr. Mattingly will be responsible for developing and utilizing computational methods for performing analyses of nuclear detection technologies for projects supported by the DOE/NNSA NA 22 Nonproliferation Research and Development programs, the NA42 Office of Emergency Services, the DHS Domestic Nuclear Detection Office, and the DOD Defense Threat Reduction Agency. Dr. Mattingly will engage with technical staff in the Nuclear Material Detection and Characterization Group and with other research groups at ORNL to support existing projects, develop joint proposals, and identify subjects and research programs for students from North Carolina State University. Dr. Mattingly is also expected to provide supervision and coordination of the students engaged in technical work with the Nuclear Material Detection and Characterization Group. The Institute for Nuclear Energy Science and Technology (INEST), referred to as ?the Institute? was created to improve alignment of the various nuclear energy research initiatives within the Idaho National Laboratory (INL) and the universities who are part of the Nuclear University Consortium (NUC). The Institute consists of a director?s office, an Institute advisory board and five Centers of Research and Education (COREs) dedicated to the identified five mission need areas: nuclear fuels and materials research, space nuclear power research, fuel cycle research, safety and licensing research, and nuclear hybrid energy system research. Dr. Yousry Army, North Carolina State University (NC State) will collaborate with the INL and to chair the Institute advisory board committee. In this function NC State will work directly with the Institute?s director and deputy director, the INL CORE directors, the CORE university leads and other members of the advisory board. Joint appointment as Dr. Dinh is considered NCSU employee with NCSU as the assigning party and ORNL CASL as the receiving party pursuant to Joint Faculty Agreement NO JFA-2001-2. We propose to create and administer a financial aid mechanism for graduate students in nuclear engineering to be named the North Carolina State University?s Graduate Fellowship In Nuclear Engineering (NCSU?GFINE). The primary objective of NCSU?GFINE is to enhance the ability of NCSU?s Department of Nuclear Engineering to recruit and retain outstanding individuals and to provide incentive to the sponsored graduate students to maintain high academic performance. In addition, the selection formula will slightly favor minorities, women, and persons with disabilities in order to further promote diversity in the department?s graduate student population. Ultimately, the collective effort by US educational institutions to raise the admission standards and to diversify their graduate student populations, as proposed here for NCSU, will translate into a highly competent and diverse cadre of leaders for the nuclear engineering endeavor at large. The benefit to the nation from NCSU?GFINE is that it will contribute to the production of a highly competitive group of advanced-degree nuclear engineers capable of assuming leadership positions in their area of specialization within the field of nuclear engineering. The diverse profile of NCSU?GFINE fellows will be reflective of the US?s population and supportive of the nation?s goals of achieving social justice and economic equity for underprivileged groups. The so-developed workforce will be best positioned to lead the nation?s charge to reinvigorate its nuclear industry, and will shepherd the design, construction, operation, and regulation of new and innovative nuclear facilities, while maintaining the safety and security of processes for the handling of requisite nuclear materials. The commitment by NCSU?s Department of Nuclear Engineering and College of Engineering to the success of NCSU?GFINE is evidenced by a cost-sharing contribution. The support of industry for the Department and its mission, and their interest in NCSU?GFINE is evidenced by their contribution to the cost-sharing arrangement.